Description: The eDu LPC2138 is a NXP ARM7TDMI (16 & 32 bit) based LPC2138 microcontroller self study kit, suitable for teaching and learning embedded system programming. This tutorial is intended to give a detailed picture of programming the Philips (NXP) LPC2138 ARM7 microcontroller. The tutorial kit includes all necessary tools to assist you in developing various applications your self. The Philips ARM7 Microcontroller LPC21XX series is a high-performance while low-cost embedded processor. 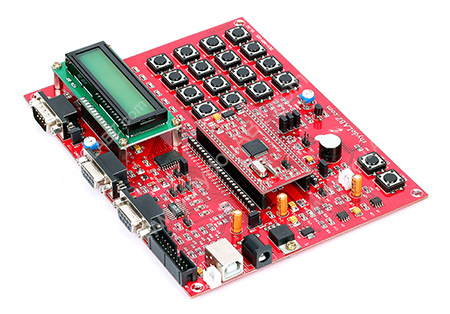 It includes several useful modules, like I2C, RTC, PWM, UART, ADC etc. 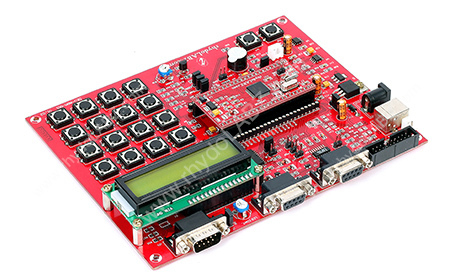 It is quite convenient for embedded system designer to use it as an all-in-one solution. Note: The USB connector, provided on board, is only for powering. 512 KB Programmable Flash Memory provides minimum of 10,000 erase/write cycles and 10 years of data-retention. In-System/In-Application Programming (ISP/IAP) via on-chip boot-loader software. Single Flash sector or full chip erase in 400 ms and 256 bytes programming in 1 ms.
Embedded ICE and Embedded Trace interfaces offer real-time debugging with the on-chip RealMonitor™ software and high speed tracing of instruction execution. Two 8-channel 10-bit A/D with conversion times as low as 2.44 us per channel. Single 10-bit D/A converter provide variable analog output. Two 32-bit Timers/External event counters. Four Capture and four Compare channels. PWM unit with six output pins. Multiple serial interfaces including two UARTs, two Fast I2C (400 kbit/s), SPI™ and SSP with buffering and variable data length capabilities. Up to 47 of 5 V tolerant general purpose I/O pins. Up to nine edge or level sensitive external interrupt pins. 60 MHz maximum CPU clock available from programmable on-chip Phase-Locked Loop (PLL) with settling time of 100us. On-chip integrated oscillator operates with external crystal in range of 1 MHz to 30 MHz or with external oscillator from 1 MHz to 50 MHz. Individual enable/disable of peripheral functions. Processor wake-up from Power-down mode via external interrupt or Real-time Clock.